On 28 March 1574, Thomas Boothe of Newsome Wood buried his wife Katherine and married again to Alice Crosland on 25 July. Their nuptial happiness was short lived. The following March, Thomas, “by sodeyne mischaunce was slain in a coal pytte the roof falling upon him and was buried.” Alice died in childbirth a few months later at least partly due, we may suspect, to her bereavement. This episode illustrates the nature of much of the evidence which follows. It is only when some tragedy occurs or when some grievance needs to be redressed that the underground existence of the miner comes to public attention. But even then it is very difficult for those who have not worked in a mine to imagine the conditions, even if vividly depicted. From numerous scattered references and a couple of more detailed accounts we are however, able to build up a fairly comprehensive picture of work in local collieries in the period before the emergence of modern legislation and technology ended mining practices which, in some ways, had changed little since the Middle Ages. The Development of Local Coal Mining. Although this account is not primarily concerned with the techniques and economics of mining, a brief outline of its development is necessary. The pit where Tom Boothe met his death must have been that described ten years later as, “a cole mine of small value digged and wrought by John Lockwood or by others…” as it was the only one then in the Manor of Almondbury. (2) Colliers are referred to in the Almondbury parish registers in 1605 and 1651 again, in both cases, being Newsome men. (3) As early as 1515 coal was being dug at Flockton in the adjacent Manor of Wakefield (4) but in the 16th century wood and charcoal probably remained the main domestic and industrial fuel. The geographical extent of local coal mining is evident from the first six inch series of Ordnance Survey maps surveyed around 1850, although these do not make the size of a colliery, or whether it was still working, apparent. According to Mrs Jaggar’s History of Honley, Haigh’s Hall Ing Collieries were closed as a result of the opening of the railway in 1851 which allowed coal from Barnsley pits to be imported into the Huddersfield area. (18) However, in 1856, during the Commons Inquiry into the Kirkburton to Barnsley railway bill, John Sheard, a Lepton mine owner and surveyor said that the previous year only 29,000 tons came from Barnsley and it offered no competition in the Huddersfield area. In the Clayton West area where the proposed line was to run, only 30hp of steam power was in use and it was supplied by local coal. A total of 346,173 tons was consumed around Huddersfield which used some from the Batley-Dewsbury area and much of Sheard’s own coal was in demand for smelting. The reasons for the contraction of local mining can not be ascribed simply to the advent of the railways, which in some cases may even have had a beneficial effect. Whiteley’s Thurstonland colliery had a siding at Brockholes in the 1860’s for instance. (20) The closure of Hall Ing colliery may also have been due to the exhaustion of reserves as was the case with Uriah Tinker’s Lower Holme House colliery near New Mill where the plant was sold off in 1862 (21). Coal production reached a peak in 1867 with 384,700 and 112,500 tons being produced by Huddersfield (not including Flockton) and Holmfirth collieries respectively, declining in 1868 to 300,500 and 87,470 tons. The output of about 36 collieries in the former area and 13 in the latter fell the following year to 111,295 and 36,537 tons and had slumped by 1872 to only74,757 and 25,732 tons. (22). The usual method of colliery working in Yorkshire by this time was by benks (see Diag.1), an intermediate practice between the wasteful pillar and stall method which left a lot of coal intact to support the roof, and the longwall method used today where most of the seam is extracted. (24) Although gunpowder was used in collieries, at least by 1820, there are few local references to it. The coal was worked at the face of the benk by the collier using a hammer, wedges and a pick and lifted or shovelled into a corve to be transported to the pit bottom by the hurrier. As early as 1699 we hear of the burial of Isaac Crowder, “a poor boy being slaine in a coale pitt at Flockton”, the term “poor boy” perhaps indicative of a parish apprentice (27). Other hurriers worked under the supervision of colliers who were their fathers or other relative. John Dixon, secretary of the West Yorkshire Miners’ Association in 1865, started work in a pit at Breistfield in 1835 at the age of 7, hurrying for his father. (28) But even a parent’s presence could not always alleviate the dangers or horrors of pit work. After the loss of one son in a roof fall two years earlier, John Sedgewick had to practically drag his son James to begin work in Westwood pit at Honley in 1830. Once underground the boy soon disappeared and was not found for four days. He was in the old workings where his brother had been killed, hoping to die in the darkness rather than to have to work in the pit. (29). This may have been the extreme reaction of a frightened child, but real fear must have been experienced by many of the hurriers at some time. Some children did not come from mining backgrounds. Abraham Lockwood, who started work at a pit at Lockwood at a tender age as a trapper, opening and closing ventilation doors, was the son of a cloth dresser and later was apprenticed to his father’s trade (30). An unknown proportion were pauper children, such as the eleven year old orphan Sarah Walker, who was killed when a stone knocked her out of a corve being raised up the shaft of Kaye’ pit at Overton. (31) In 1841, when there was much criticism of the New Poor Law and the way it was being administered in Huddersfield, there was outcry about a seven year old workhouse child who was put out as an apprentice to a Thornhill collier. The child weighed only 41 pounds and was so unfit for work that the collier had to send him back. (32). The treatment of hurriers varied – but physical punishment was common. Sometimes a collier was prosecuted when he went too far, as in the case of one who belted a hurrier in Waterhouse’s pit at Lindley in 1849 or the Kirkheaton collier who assaulted one in 1864. A hurrier was almost “throttled” by a collier in an argument about a tub in a Lepton pit in 1868. (33) Colliers could also be protective towards their hurriers if others interfered with them. At Emley in 1856 an argument between two boys about the right of way in the gate resulted in one hurrier tipping the on-coming empty tub off the rails. He was consequently kicked by the other hurrier’s collier, although full tubs enroute to the pit bottom customarily had precedence. (34). A banksman was assaulted at Moorhouse’s pit at New Mill in 1857 by a collier whose hurrier he had allegedly “ill used”. The hurriers were usually paid by their colliers. In 1854 at Sir J.L.Kaye’s Blossom Pit at Whiteley Upper the rate was nine shillings a week, while two years later a hurrier at Kirkburton summoned a collier for non payment of 3s.6d wages for three days work. In defence, the collier, adopting a “peculiar theory of the value of numbers”, claimed that the agreement was only for 1s.2d a day! (36). The hurriers’ wages compared well with the wages of children in local mills who might earn 4s.6d. to 7s.6d. a week. However, as bad as conditions were in mills and factories they did not approach the terrible conditions prevalent in collieries. No description can add anything to the eyewitness testimonies given to the Commissioners inquiring into child employment in mines in 1842, extracts of which are reproduced below. (Appendix A). The pit is a dangerous as well as unpleasant and unhealthy environment and a wide variety of hazards confronted the children. The ever present threat of roof-fall claimed a 10 year old hurrier at Stansfield & Briggs’ colliery at Flockton in 1838. The following year two brothers aged 12 and 14 and their 16 year old sister were killed when the rope lowering them down the shaft in a corve broke, sending them plunging over 80 yards. (37). As well as such inherent risks, children could be placed in extra danger because of their lack of safety consciousness or through playfulness or fatigue. (38) At Joseph Haigh’s Woodsay Pit in 1848 a boy “in his eagerness to descend” missed his footing when stepping into a corve and fell down the shaft (39). A hurrier at Bradley Colliery in 1857 disobeyed orders and took a short cut down a steep gate with a corve holding about 2 cwt of coal which ran away with him, smashing his head against the wall. He died later in the infirmary. (40). Other forms of indiscipline had fatal results. The hurriers at Kirkheaton colliery in 1839 used to play at swinging on the corves as they were being raised, then dropping off. One twelve year old boy left it too late and dared not let go until near the top of the shaft he could hold on no longer falling fifty yards. (41) Another game was played on the surface at Cliff Wood colliery at Brockholes where the boys used to ride on the corves down the incline of the tramway. One was injured in 1854. (42) Even when the pit was not working childish exuberance could have tragic results. A hurrier fell down the shaft of Kirkstyes colliery at Cumberworth in the same year although the pit was temporarily stood due to gas (43). The brutalising conditions of pit life must have contributed to unruly behaviour. In fact in 1867 fighting and such “insubordination” were so bad at Kaye’s Flockton colliery that it was claimed the hurriers had, “almost become unmanageable” Boys on the way to work at a Thurstonland pit in 1859 demonstrated their unruliness by stoning the train between Brockholes station and Stocksmoor tunnel.. One 12 year old was prosecuted and fined £2. (44). As late as 1853 an 8 year old boy (the son of a shoemaker), was killed at Fieldhouse colliery where he was hurrying for his brother when the chair ascended without a signal. The inquest jury could only express disapproval at boys so young being employed in a pit. (45) But it was the employment of females underground, outlawed by the 1842 Act, which most roused public opinion and offended middle class morality. Conditions in local pits gave rise to one of the most graphic and oft quoted condemnations by the Commissioners. The hurriers’ task was lightened by the introduction of ponies. These were working in the maingates of some pits by the 1840’s but locally they were not introduced into Hall Ing colliery until shortly before 1853. (48). Despite the 1842 Act, the 1850 Act which instituted Mine Inspectors and the 1860 Act prohibitting boys under twelve from working underground (except those of ten or eleven who had a certificate of elementary education), mining remained a perilous occupation for children and adults. Death and injury came in many forms. After 1850 the inspectors adopted a basic classification of accidents which we shall follow. This grim catalogue of death and agony is not fully comprehensive, but it vividly illustrates the main tasks and the accompanying hazards encountered in mining. The early safety lamp was difficult to work by and after its introduction some colliers still preferred to use candles. In 1841 a collier at Emroyd colliery at Flockton removed the gauze from his lamp and he was killed along with three boys when a roof-fall forced a build-up of gas out of the goaf. The flames ran down the hurrying gate and a boy 100 yards away was injured (69). A collier was killed at Fieldhouse colliery in 1850 when he used a naked flame in defiance of instructions (70). Fieldhouse was the scene of a more serious explosion in 1853 which is dealt with in greater detail below since the inquest throws light on contemporary ventilation practices. Emroyd pit, 1850, two killed. it was thought that a safety lamp may have been responsible. Fortunately gas was less of a problem in local pits than in many others in the coal field or this toll may have been even higher. These are only some of the accidents which came to the notice of the press and, at least prior to the keeping of records from 1850, there is no way of knowing what proportion of fatal accidents they represent. It must also be remembered that, given the standards of medical care available, even non-fatal cases involved much suffering. Hardship would result from long absences from work even for those who belonged to some friendly society or sick benefit club. From the symptoms described it is possible that the “asthma” of Tom Moore was in act silicosis or pneumoconiosis caused by inhaling stone or coal dust. Premature death must have been a common fate for many colliers who had been in the pit since childhood. Against the background of these conditions it is not surprising that colliers were often individually obstinate or collectively discontented over various grievances. Coal owners, like other 19th century employers, dealt with this resistance with a combination of paternalism and coercion. The Masters and Servants Act could be invoked to prevent strikes, individual protest or lack of work discipline by prosecuting miners who left work without giving the statutory notice included in their contract of employment. Another case arose in one of Kaye’s pits later that year, this time for absenteeism and disobeying the “lawful commands of his masters agents.” At Blossom Pit at Whiteley Upper it had become the habit of the colliers working in the Cromwell seam – which was described as three feet three inches high and gassy – to abandon work early and go drinking, leaving the hurriers to get the coal. As there was no locks on the safety lamps it was dangerous to leave them with the hurriers unsupervised. One collier, James Parker, was summonsed as an example to the others since he had been warned several times about leaving his hurrier and for working with the top of his lamp off. One day when he tried to come out early he was lowered back down the pit three times, holding up work for an hour. Finally allowed to the surface, he threatened to hit the banksman with his lamp. Parker was defended in court by W.P.Roberts, known as the “miners’ attorney”, who often offered his services to trade unionists and workers in dispute. His presence may indicate that there was more behind the case than that claimed by the prosecution. He stated the men’s complaint that sticks put on their own tubs for the banksman to record the amount of coal sent out were being removed, so that tubs were not accounted to them and wages were reduced. The hurriers did not do any coal getting as was alleged, they only brought the tubs to the pit bottom to the hanger-on. According to the colliery agent the men worked irregularly and wages varied from 4d. to 6s.10d a day, they could earn up to £1.6s.3d. a week out of which they paid 9s. to the hurrier and rent for their lamps and oil. Such variations in wages however did not depend solely on the ability or motivation of the collier, but also on the conditions in the workplace affected by such factors as geology, water, gas, etc. We hear from other areas of employers making deductions or cutting wages by various devious means. The removal of the tally sticks from the tubs at Blossom pit may indicate that some malpractice was indeed taking place. One of the recurring demands made by miners before 1870 was for checkweighmen to ensure that the output of each man was correctly recorded on the pit top. In this case the master’s version was accepted by the magistrates and James Parker was sentenced to fourteen days in the House of Correction. “That’s nothing,”, he replied, “I could stand on my head that time.” (80). Unlike the textile workers of the Huddersfield neighbourhood, miners are notable by their absence from working class political movements of this period. This may be attributable to a number of factors – the brutalising conditions of work, the control of the masters outlined above, relatively good pay (at least in times of thriving trade) and the dispersion of miners in communities where weavers were more numerous and with whom they had limited contact. A Thornhill miner was transported for life and two Breistwhistle miners hung for burglary during the Luddite disturbances of 1812 but it is clear from the trial that they were using Luddism as a cover for common crime. (86) In 1820 however at least one collier, Sam Sharpe of Colne Bridge, was involved in the preparations for the uprising that year (87). There is no mention of miners participating in the radical agitation of the early 1830s nor in the Chartism which succeeded it. 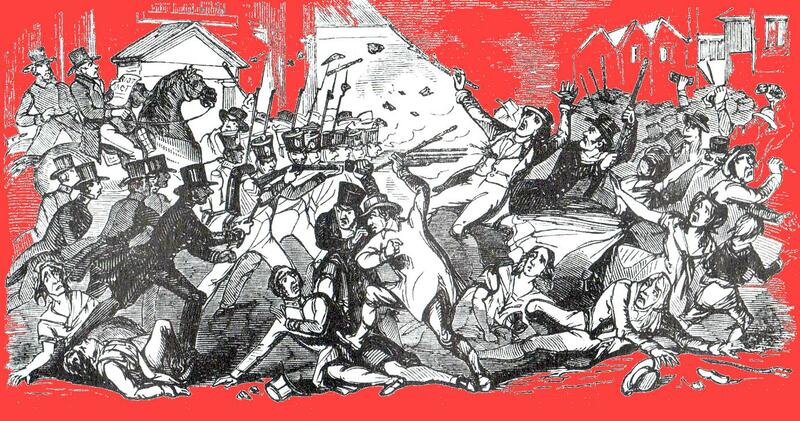 During the August of 1842 there was a general strike throughout the industrial areas of Lancashire, Cheshire and Yorkshire as thousands of workers marched across the countryside losing down workplaces – the so called “Plug Plot”. Haigh’s colliery at Hall Ing, Honley and pits in the vicinity of New Mill were stopped from working as, no doubt, were others along the line of march of the strikers. How willingly local miners joined is not recorded although at least one, Samuel Howarth of Flockton, (if he is the coal miner of that name recorded in the previous years’ census) played a prominent part in spreading the strike, including stopping Norton’s factory at Scissett. Due to lack of co-ordinated trade union or political leadership and because of brisk repression by the authorities, the strike movement petered out. (90). The Union was encouraged by the Chartists and Feargus O’Connor’s national newspaper the Northern Star, published in Leeds, printed reports on the progress of the Miners’ Association. The Honley meeting referred to acknowledged its thanks to the Star and the delegate meeting at Barnsley agreed on a penny a week extra subscription to help the Victim Fund to help Chartist prisoners arrested after the previous year’s strike. The unionisation of miners was thus also assisting the spread of political ideas amongst them. Huddersfield – The miners of this district beg to return their thanks for the following sums – Mr David Shaw’s Factory, Honley £1.7.0d. ; Elland Society, £1.9.6d. ; Mr Thomas Moorhouse colliers, 6s. ; Rock Inn Society,1.4.0d. ; a few Odd Fellow Lodges,10.2d. ; Messers Tinkers’ colliers, 8s. ; Mr Sergeant Marshall, retail brewer, 5s. ; a few friends at Berry Brow, 15s.9d. ; and sundry small sums amounting in the whole to £8.12s. The following decade saw the decline and revival of the West Yorkshire Miners’ Association (WYMA). In April 1864 the 75 men and boys at Stansfield & Co.’s Lane End colliery at Lepton struck against a 1d. reduction for getting and the loss of 1s.6d. “prize money”, or bonus, for every 20s. earned. They claimed that they had “long submitted to rules which would not be endured in any other district in the kingdom.” including a 4d. a day fine for absenteeism, even if it was due to illness. After meeting with William Brown, a leader of the WYMA, the miners joined the organisation, a move which appeared to “irritate the employers”. Supported by funds levied from WYMA members at other pits and from money collected at religious camp meetings, the men held out until August. The employers refused the compromise that the men would seek no advance of wages for six months if the old wages were restored but they conceded that the men could remain in the union if they returned to work and accept a small reduction. The WYMA continued its attempts to organise the area and in October a meeting of miners at Kirkburton was addressed by Brown.(109). Squire Brooke’s beliefs had even more tragic results on another occasion. The colliery and adjacent clay works at Fieldhouse, just off Leeds Road near Huddersfield, was managed by his son, Edward jnr. By 1854 young Mr Edward was also head of Victoria Pottery on Leeds road as well as having other more extensive business interests. In that year for instance he was recruiting miners, navvies and brickmakers to work in a new mine of the Mersey Coal Co. in Van Dieman’s land. Seventeen men were sent off from Huddersfield station with a band playing “The girl I left behind me” and other suitable tunes. (111). The fact that such large and respectable employers could ignore basic mine safety demonstrates the prevalent standards of the time. Out of deference to his father’s wish that men should not work on the Sabbath, Edward Jnr. directed that the ventilation furnace at Fieldhouse colliery should not operate between Saturday night and Monday morning. On the morning of Monday 20 June 1853, when about 50 men and boys were working, an explosion occurred in the Hard Bed killing two hurriers, John Haigh aged eleven and John Hiley, fourteen and injuring sixteen year old John Furniss and John Boothroyd. At the inquest the bottom steward, Samuel Clegg, a 45 year old barely literate collier who had been promoted four years previously, said that fire damp had not been known in that seam before. Air was drawn in through a day hole near the canal along airways, which were four feet by four feet and it was not thought necessary to use safety lamps. He conceded that the explosion would not have happened if he had tested the workplace with a lamp, or if the men had used them. A collier, James Clarke, confirmed that he too had never known fire damp, although there was sometimes blackdamp present. There had been a good wind only fifteen yards away from where he was working on Saturday. When they were driving “slips” they might be several days out of an airway and no air pipes or brattices were used to direct air to them. Another collier, James Astley, said he worked with a candle unless specifically told by the steward that it was unsafe. If he had occasion to use a safety lamp it was kept locked and he didn’t interfere with it since he didn’t know how they worked. The pit blacksmith was in charge of the safety lamps. Three years after negligence was also blamed for a very different accident at Henry Ellis & Co.’s Kirkstyes colliery at Cumberworth. At Kirkstyes a six foot seam (including two bands of muck) was worked from two shafts, the south one, operated by a horse gin, was 250 yards up a one in eight gradient from the north shaft where there was a steam engine for winding and pumping. To the west were old workings, drained by a drift, which had been broken into about sixteen months earlier. It was decided to work below these old workings in the belief that they were at least six yards above. When headings, board gates or levels are approaching old works the under viewer or the deputy must order safety lamps and horizontal boring rods to be used so as to guard against a sudden irruption of gas or water. These local incidents were only a fraction of the hundreds of lives lost before parliament accepted the need for the 1855 Act which laid down the basic regulations for collieries and the 1872 Act which issued certificates of competence for colliery managers and stipulated that daily inspections of pits should be made. Even this latter law was not passed until the terrible explosions at Lundhill near Barnsley in 1857, which claimed 189 victims and Oakes colliery, also near Barnsley, in 1866 when 361 died. Banksman – man on pit bank, or pit top, who is in charge of the lowering and raising of materials and personnel up and down the shaft. blackdamp – or chokedamp, carbon dioxide. board – main underground roadway. brattices – wooden panels or heavy fabric used to direct the flow of air underground. Chair – or cage, lift on which people and corves or tubs are conveyed up and down the shaft. 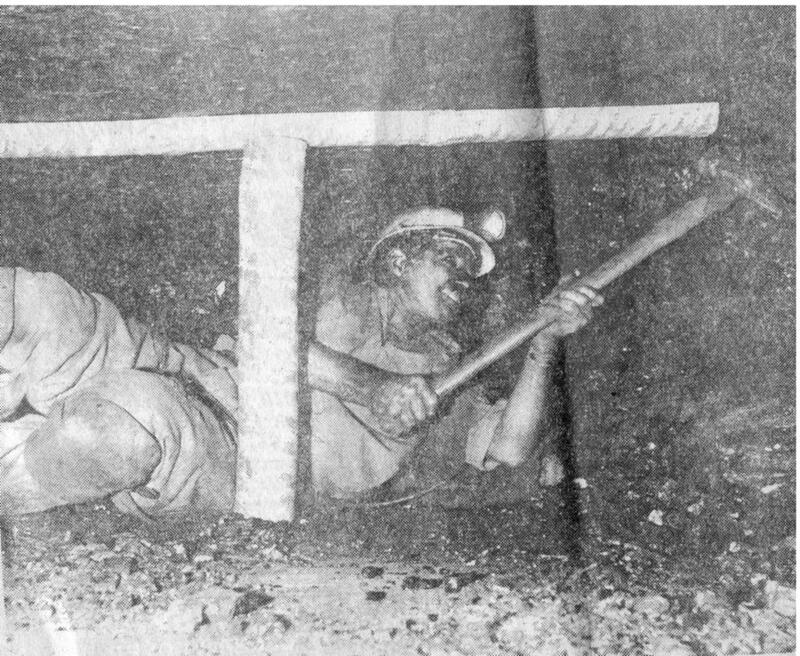 Checkweighman –man chosen by the miners to ensure that their output of coal is correctly recorded at the pit top. clatch/clutch irons -device on end of winding rope to which chair or scoop was attached. day hole – mine where access is not by vertical shaft but by a tunnel or drift. goaf/gob – area where coal has been extracted from seam and the roof has been left to subside. Hard Bed – one of the main seams in the area, along with the Soft Bed, both being relatively near the surface and outcropping in some places. punsheon – Wooden prop used to support roof as coal is being got. Safety lamp – Oil lamp in which the surrounding air is prevented from coming into direct contact with the flame by a copper gauze and later also a glass, preventing the flashpoint which could ignite methane. straightwork – the opening up, or driving, of underground roadways. Mary Holmes Aged 14. Mealhill pit, Hepworth. I have been eight years working in pits. I have always hurried;I never thrusts you saw me with a belt round my waist and the chain through my legs. I hurry so in the board-gates. I always wear lad’s clothes. The trousers don’t get torn at all. It tires me middling; my back doesn’t ache at all, not my legs. I like being in pit and don’t want to do nought else; I never tried to do anything else. Sometimes I get cold by its being so wet; the wet covers my ankles. Sometimes I stop and fill the corves after the getter is gone. I don’t know how long I shall stop in the pit. I am sure I’d rather be in the pit where I am thrashed sometimes than do anything else. I went into the pit to help before I was five years old. I used to thrust; I didn’t do it long. I hurry now with a belt and chain in the board-gates. there are no rails there. We have to hurry full corves this way, up hill as well as down. I do this myself and I have sixteen runs a day for which I have one shilling. Our breeches are often torn between the legs with the chain. The girls’ breeches are torn as often as ours; they are torn many a time and when they are going along we can see them all between the legs naked; I have often; and that girl, Mary Holmes, was so today; she denies it, but its true for all that. Margaret Gormley,aged 9, Messers Waterhouses’ pit, Lindley. I have been in the pit thrusting corves about a year. There are two other girls working with me. I’d rather lake than go into the pit. I’d rather set cards than go into the pit. They flog us down the pit; sometimes with their hand upon my bottom which hurts me very much; Thomas Coppland flogs me more than once a day which makes me cry. I descended this pit accompanied by one of the banksmen and, on alighting at the bottom, found the entrance to the mainway two feet ten inches [high] and which extended 500 yards. The bottom was deep in mire and, as I had no corves low enough to convey me to the workings, waited somtime under the dripping shaft the arrival of the hurriers, as I had reason to suspect there were some very young children labouring there. At length, three girls arrived with as many boys. It was impossible in the dark to distinguish the sexes. They were all naked excepting their shifts or shirts. Having placed one in th corve I gave the signal and ascended. On alighting on the pit bank I discovered it was a girl. I could have not believed that I could have found human nature so degraded. I run 24 corves a day; I cannot come up until I have done them all. I’d rather set cards than work in the pit. She stood shivering before me from the cold. The rag that hung about her waist was once called a shift, which is as black as the coal she thrusts and saturated with water, the drippings of the roof and shaft. During my examination of her the banksman whom I had left in the pit came to the public house and wanted to take her away, because, as he expressed himself, it was not decent that her person be exposed to us; oh no! it was criminal above ground; and like the two or three colliers in the cabin he became evidently mortified that these deeds of darkness should come to light. William Pickard, Steward to Sir J.L.Kaye. I have known a married woman hurrying for man who worked stark naked and not any kin to her. I hurry for Charles Littlewood; I am let to him,he is no kin to me; he works stark naked; he has no waistcoat nor nothing. The children hurry with belt and chain, the chain passing between ther legs, girls and all. It privilege some poor folks to bring their girls to pits and I have seen many who have made respectable women and, for ought I know, useful wives. I don’t know that girls have more impudence than the other girls that are brought up in other ways. It is true that they all have impudence. Commissioners Report on Employment of Children in Mines 1842,pages 25 para.122;,p.77,para.320;p.79,para.327. 1. Almondbury Parish Registers, 28 Mar,25 Jul 1574; 12 Mar,29 Sep 1575. 2. D.H.Holmes, The Mining and Quarrying of Huddersfield and District (Huddersfield 1967)p.23. 3. Almondbury Parish Registers, 13 Oct, 13 Dec 1605, 6 Apr. 1651 (Tom Shaw and Robert Haigh. 4. Holmes op cit. p.23. 6. G. Redmonds,’ Mining and Coal Getters ‘Huddersfield Examiner (HE) 22 Oct 1983. 7. Leeds Mercury (LM) 16 Nov 1779. 8. LM 4 May 1784. 9. Land Tax Returns, County Record Office, Wakefield. Kirkheaton. 1783.R.H.Beaumont’s Land, Jonathon Haworth coal pits;1792 Wm. Stancliffe coalpits; 1801 Widow Stancliffe coal pits. Honley 1788. Earl of Dartmouth’s colliery; 1793 John Lockwood colliery. Farnley Tyas 1788. George Jaggar colliery. Almondbury 1781.Sir John Ramsden’s Land, John Bradley and Mrs Crowther coalpits,Jos.Jaggar coal pits;1788 Mr Crowther & Co. coal pits. ; 1790 Wm Bradley coal pits. Fulstone 1782, Jos Charlesworth coal pits, Jos.Armitage coal pits;1785 William Newton coal pit;1794 Beaumont Esq Land, Nathaniel Berry coal pit; 1803 John Bates, Butterly coal pit. Huddersfield 1789 Ramsden’s land, Jos Bradley coal pit. Kirkburton 1785.Edmund Jessop coal mine; 1787.Sir John Kaye’s land,Messers Milnes & Jaggar coal mine. 10. Dartmouth Estate Terrier 1805, Estate Office, Slaithwaite. 11, LM 8 Feb 1806. 12. LM 12 Feb 1806. 13. Huddersfield Chronicle (HC)7 Dec 1867. 15. HC 18 May 1867;HE 9 Aug 1854, Two fancy weavers, seeking coal in a disused dayhole of Norton were suffocated by gas. 17. See below,.Tom Gelder and John Wagstaff. Also in 1841 Halifax Guardian 1 Oct Elijah Clifford of the Shepherd’s Arms lost his license when he was stranded in the pit bottom at Grimscar by a winding engine breakdown and was unable to attend the brewster sessions. Another publican, Ben Lockwood of the Blacksmiths Arms was the proprietor of Shuttle Eye colliery,Huddersfield Weekly Examiner HEW 8 Nov 1883. 18. M.A.Jaggar History of Honley (Huddersfield 1914) p.298. 20. HC 25 Aug 1860. 21. HC 24 May 1862. 22. Holmes,op.cit. pp.31-33; E.Baines Yorkshire Past and Present. 23. For the geology of the area see Holmes,op.cit. and Institute of Geological Sciences,Britsh Regional Geology:The Pennines and Adjacent Areas (HMSO 1954) Chapter VI. 24. R.L.Galloway Annals of Coal Mining and the Coal Trade ( orig.1904,David & Charles reprint 1971) Vol II Chapter XIX. 25. HC 23 Jan 1864. 26. Parliamentary Papers 1842 XV Inquiry into the Employment of the Children of the Poorer Classes in Mines and Collieries. 27. Thornhill Parish registers 1699 Sep 7. 28. F.Machin,The Yorkshire Miners (Barnsley 1958) p.215. 29. LM 15 May 1830. 31. HG 27 Mar 1838. 33. LM 31 Mar 1849;HC 29 Oct 1864; HE 25 Apr 1868. 34. HE 9 Feb 1856. 35. HE 3 Jan 1857. 36. HE 4 Nov 1854; HE 1 Mar 1856. 37. Leeds Times (LT) 2 Feb 1839; Northern Star 7 Apr.1838. c) Desire to show off. d) Contempt for safety first. f) Boredom leading to horseplay. 39. LM 4 Nov 1848. 40. HC 10 Jan 1857. 41. LT 24 Aug 1839. 42. HE 25 Feb 1854. 43. HE 5 Aug 1854. 44. HC 16 Feb,2 Mar 1867;HC 23 Apr 1859. 45. HE 15 May 1853. 46. PP 1842 XVI,p 181, sub-commissioner Symon. The question arises, was the commissioner’s knowldge of brothels as wide as that of collieries? 48 HE 12 Nov 1853. 49. LM 8 Oct 1803. 50. LM 1 Jun 1833. 51. LT 10 Nov 1838. 52. LM 26 Aug 1843. HE 27 Oct 1855. 53. HE 28 Jul 1855. 54. HC 18 May, 27 Jun 1867. 55. NS 3 Feb 1838. 56. LT 24 Oct 1846. 57. LM 15 May 1850. 58. HE 4 Jun 1852. 59. HE 13 Jun 1857;HE 12 Jun 1858. 60. HE 26 Feb 1870. 61. LM 1 Jun 1850; HC 11 Dec 1852. 62. HE 25 Oct 1856;HC 16 Jan 1864. 63 HE 14 Jan 1865;HC 27 Jun 1867;HC 7 Dec 1867. 64. HC 10 Jul 1869. 65. HE 7 Nov 1857. 66. LM 13 Jul 1833. 67. LM 1 Jun, LI 8 Jun 1833. 68. NS 22 Aug 1840;NS 11 Dec 1841;Galloway,op.cit. p.60. 70. LM 9 Nov 1850,Less than two yers later, James Ellam of Kirkburton the father of the victim Charles Ellam. was killed in Haigh’s colliery at Flockton Moor when the winding rope slipped while he was descending the shaft to inspect a chimney from an engine in the pit bottom. He left a widow and seven children. HC 1 May 1852. 71. Galloway,op.cit. Chapter VI; LI 18 Mar 1848; HC 27 Sep 1851..
72. LT 9 See 1843. 73. HC 25 Aug 1860. 74. HC 19 Jan 1860; HC 7 Dec 1867. 75. HG 1 Jan 1842. 76. HG 7 May 1836. 77. HG 6 Nov 1854 78. HE 4 Nov 1854. 79. HE 12 Nov 1859;HE 25 May 1866. 80. HE 4 Nov 1854. 81 .Disputes between the men themselves were not uncommon. In 1848 a Grange Moor collier was prosecuted for kicking another whilst at work.LM 12 Aug 1848. 82. HE 18 Apr 1868. 83. Leeds Intelligencer 3 Jan 1820. 84. NS 6 Jan 1844;LM 19 Jan 1850; HC 31 Dec 1864; HE 21 Ar 1860. 85. LT 15 Jun 1844. 86. Poceedings of the York Special Commision 1813, trial of John Lumb, John Swallow, Joshua Fisher. 87. Public Records Office, treasury Solicitor’s Papers,TS.11/1013.Deposition of Edmund Norcliffe et.al. 88. LM 24 Dec 1819. 89. Machin op.cit p.38; Wentworth Woodhouse Muniments (Sheffield City Library) g.9.2. Charles Ramsden to the Lord Leiutenant 11 Aug 1832. 90. LM,NS,LT,HG 27 Aug to 10Sep 1842 passim. 91. NS 6 Mar 1844. 92. NS 9 Mar 1844. 93. LT 11 May 1844. 94. NS 18 May 1844. 95. NS 25 May;LT 15 Jun 1844. 96. LT 1 Jun,15 Jun 1844. 97. NS 27 Jul,17 Aug 844. 98. NS 20 Jul 1844. 99. NS 17 Aug 1844. 100. NS 13 Jul 1844, the list includes:Lepton Lodge,£4.13s;Huddersfield £3.15s.3d. ; A few friends at Emley Moor 10s.0d. ; Emley Woodhouse colliery 14s.0d.;Briestfield,£1.14s.0d. ; Flockton District, £2.14s4d. ; Friends at Lepton,1s.5d;Friends at Dalton,2s7d;Friends at Huddersfeld 8s.8d;Friends at Clayton,3s.6d;Friends at Kirkheaton 4s.6d. 101. NS 5 Oct 1844. 102. R.Challinor and B.Ripley The Miners’Asociation: A trade union in the age of the Chartists. (Lawrence & Wishart 1968) p.166. 103. HC 22 Jan 1853. 104. HE 18 Jan 1853. 105. HE 25 Jun 1853. 106. HC 14 Jan 1854. 108. HE 12 Nov 1853. 109. HC 9 Jul,22 Oct 1864; Machin op.cit. p.129. 111. HC 15 Apr 1854. 112. E 25 Jun 1853. 113. HE 26 Apr 1856. 115. Stanley Jevons. The British Coal Trade (1915,David and Charles reprints 1969). 117. HE 6 Nov. 1931; Royden Harrison,Independent Collier:The Coal Miner as Archetypal Proletarian Reconsidered (Harvester 1878) he diversity of mining conditions in the Huddersfield area supports the thesis of this book that there is no ideal type of miner. It is a part of the coalfield and a type of small scale mining which has received scant attention, see for example, John Benson, British Coalminers in the Nineteenth Century: A Social History. (Longman 1989); R.Church, History of the British Coal Industry (Oxford 1986). Just to let you know ‘Law Pit’ and ‘Oxlee Pit’ are separate mines with the Oxlee colliery near the property called ‘Oxlee’ at a lot lower level. They might all meet underground like most mines did. Not this one, but in a way related. Read Holliday sunk a pit to supply his chemical works at Turnbridge, on Dalton Bank , I think from the description. Grove Pit was put down by Read Holiday which later changed to British Dyes it is on and in Dalton Bank. It is by the bridge which used to cross the river. There is another shaft nearer Aspley and close to the river as well as Car Pit. There is also pits either side of the what is now the Cricket Pitch at Rawthorpe. We have yet to find Moldgreen Colliery. Grove pit had shafts and adits. I used to live on the top of Kilner Bank, and remembered a capped off shaft halfway up the banking from the river to Kilner bank road (below the row of bungalows) a bit of the concrete was broken away at the corner, and you could climb inside and look down the seemingly bottomless bricklined shaft. have you any idea what shaft this was? and also are there any plans to show the workings of this and the ones near the cricket pitch? What was the length of a iron rail on which tubs ran in a Yorkshire coal mine in 1940 and was the Davy safety lamp used at that time? The Davy lamp was used mainly for checking for gas by 1940 , and contined to be so used. A couple of times I had to work by the light of one when my lamp battery went out. Rails were about four yards long if I remember correctly. We used to transport them on 6 foot long trams and there was at least a yard overlapping at each end and chains had to be used to couple the trams together. Re Jim Haywood’s letter. There are two books of interest which give conditions in the mine. Victoria’s Children of the Dark by Alan Gallop BSN978 0 7524 0. Tells of the 1834 Husker Pit at Silkstone disaster. Black Diamonds, The Rise and Fall of an English Dynesty by Catherine Bailey. ISBN 978-0-141-01923-9. Tells the story of the Fitzwilliams of Wentworth. .Re The Davy Lamp. The Davy lamp is usually classed as the lamp covered in gauze with no glass. The 1940 type lamps are more of the ‘Clanny’ Type with the glass circular window with the gauze above covered in a metal hood. You’re right about the lamp of course, but most people refer to the safety lamp as a Davy Lamp. The point is, by the 1940s they were used primarily for testing for gas, rather than working by. Apart from the deputies etc who routinely used them for checking for gas, men who carried them got extra ‘lamp money’. I read the website with great interest. There is reference to the possibility of an updated version of the research including coverage of mining in Huddersfield up to the 1920’s. Has that been undertaken? I was also interested in the reference to research on the munitions. I am tying my research to a historiography of the Irish in Batley (I am a Batley ex-pat) from an Irish background. My grandfather and uncles worked in the mines (Gomersall I think). My great Aunt died from poisoning a few weeks after starting work in a Leeds munitions factory. The rest of the family worked in the mills in Batley. Thanks for your input and please keep up the great work. Dear Anthony, thanks for your inquiry and interesting comments. I have done research on local mines up to the 1920s, but have not yet written it up. I’m afraid that it doesn’t cover Gomersal. There is an interesting account of ‘The Barnbow Lasses’ – Leeds munition workers, by Bob Lawrence in Leeds History Journal Issue 21. Is this the factory where your great aunt worked I wonder ? Fascinated to find this excellent site. I’m trying to research two mines which I believe were on Northfield Lane Highburton. One at Busk farm I have managed to get mine abandonment plans for. The other simply named Northfield I have been unable to find anything. I wonder if you have come across the name in any of your research. Amazingly there are some 37 listed mine for the Kirkburton and Highburton area alone. ! Ian, i haven’t come across Northfield. If I do I will let you know. I am not surprised by the number of listed mines, the whole area is riddled with them. Thanks Roger. Have emailed you. I would be interested in seeing the plan. Fascinating site. We have been looking at a copy of an old plan of Newsome Colliery dated 1832. Does anyone know where we might find more information about this and mining in the surrounding area? A lecture has been arranged on Wednesday 9 th November 7-15 pm for 7-30 Start (£1 Charge on door) at Hall Bower Athletic Club (Cricket Clubhouse), Hall Bower. Open invitation. Roger, What is the title of the lecture ? Very interesting reading. I am particularly interested in the pits around kirkheaton area as my dad his brothers and his father all worked in the pit. Where were the pits in that area? My dad had a serious pit accident when a prop went thru his foot leaving a permanent hole. The family name is Shaw. If you follow the link to Part II, which are the notes for the period up to the 1920s, several Kirkheaton pits are mentioned. , including Lodge Mill and Throstlenest.